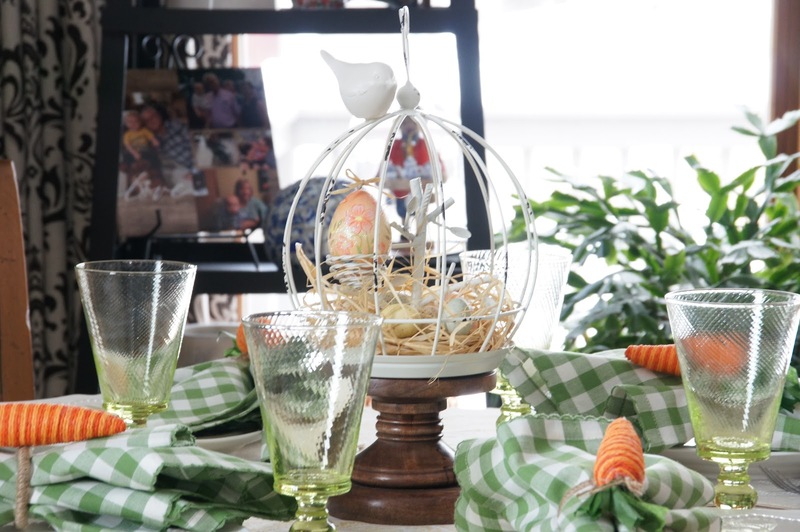 Home and Gardening With Liz: Spring Green for Easter! I wanted to show the placemats before I added the dishes and the design gets covered up. 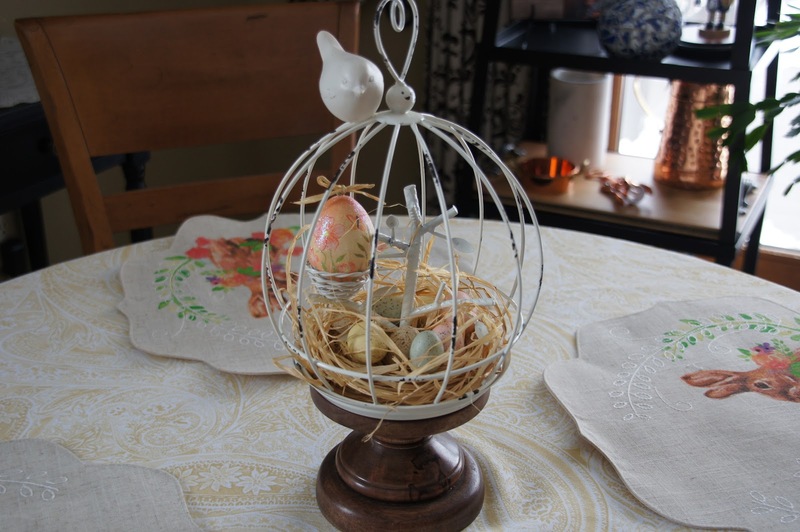 These are cute enough to leave out and I think they will migrate to the main dining table so I can continue to enjoy them! I like the quatrefoil shape, the stitched vines and colors. I found these at Kohl's. 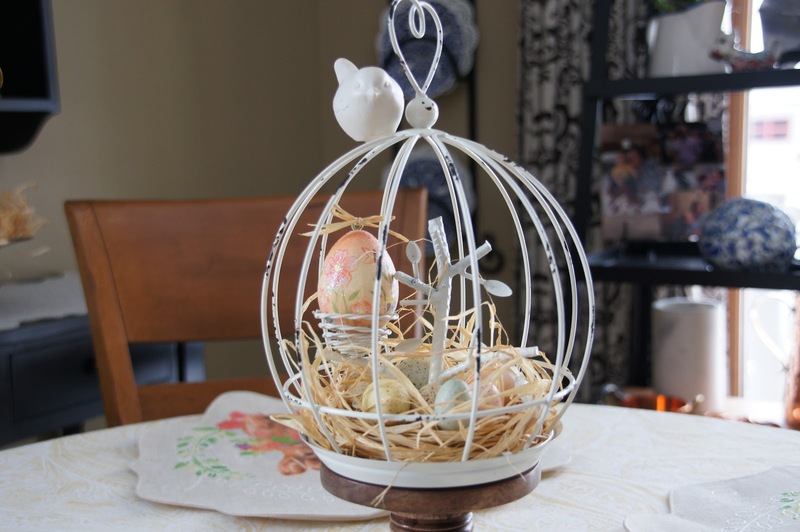 I brought this sweet little bird cage home from Hobby Lobby and thought it was so adorable with the bird sitting outside the cage so naturally I had to put an Easter egg inside the nest! I'm sure they expected a little tea light to be placed there but not this time! I think the little bird is wondering how in the world she's going to hatch these eggs! The salad dishes are from from Pier 1 (2016) - they sold them as a set of 4. 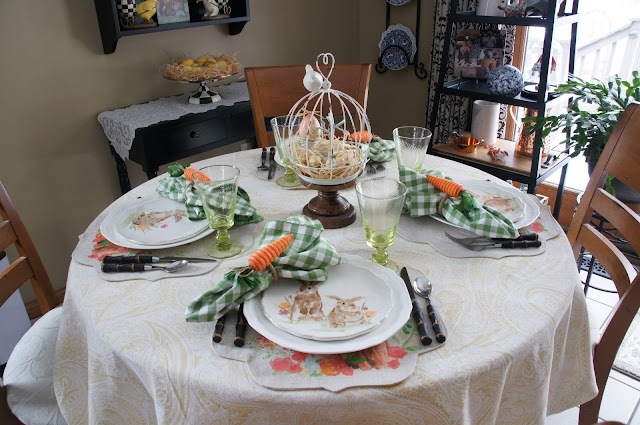 It is interesting how a tablescape can take form. First I wanted something to play off of the soft peachy/orange Easter egg, and then I found the placemats at one thing led to another. The carrot napkin rings are also from Kohls. They have such good sales! I chose the bamboo flatware for color and texture. 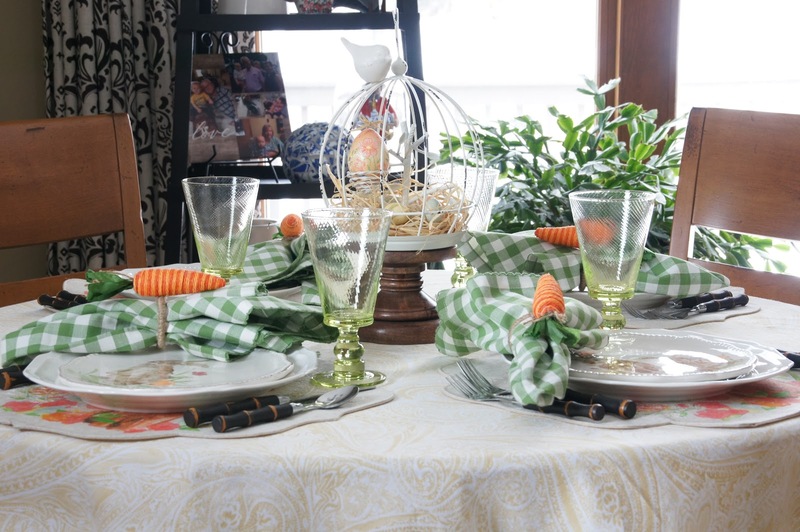 The napkins bring in a nice touch of spring green! Isn't that a sweet face! Can't wait to see lots of green outdoors! Liz, such a sweet table! I also have found almost all of my placemats at Kohls, on sale of course, with a coupon on top of that! I just bought linens there for an upcoming bridal shower. 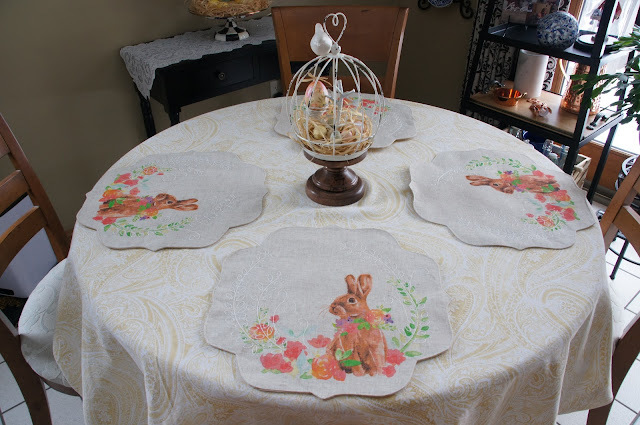 My guys have learned over the years there are placemats I leave on the table or kitchen island that are just for decoration (love your bunny placemats) and not for sitting coffee cups or eating cereal LOL! Because of likely accidents, on placemats I adore, I try to always buy an extra, because my Kohls ones never, ever wash well without bleeding. Yup! Saw those salad plates at Pier 1 and wanted them SO bad! As you know, though, my money has been funneled elsewhere this season. I can just look at yours! 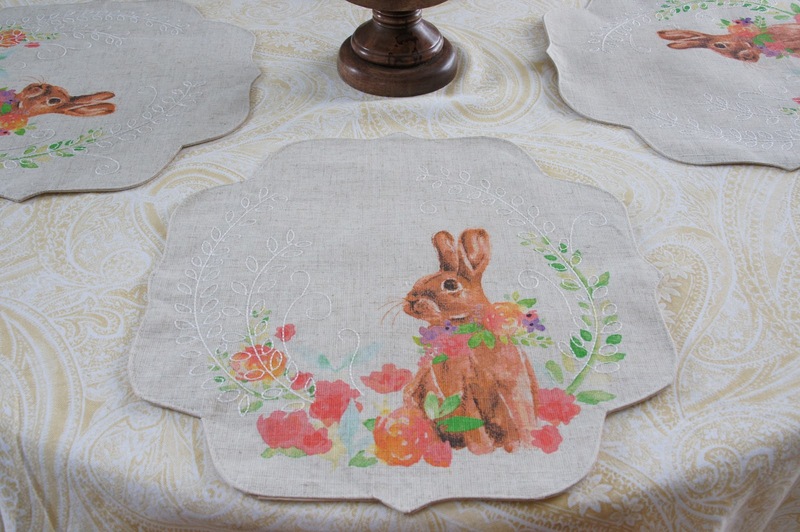 The placemats are sweet as sweet can be!!! I’d want to just use clear plates to look at those cuties throughout the meal!!! The soft colors aren’t too soft like I’ve seen out there. They’re strong enough to stand on their own. 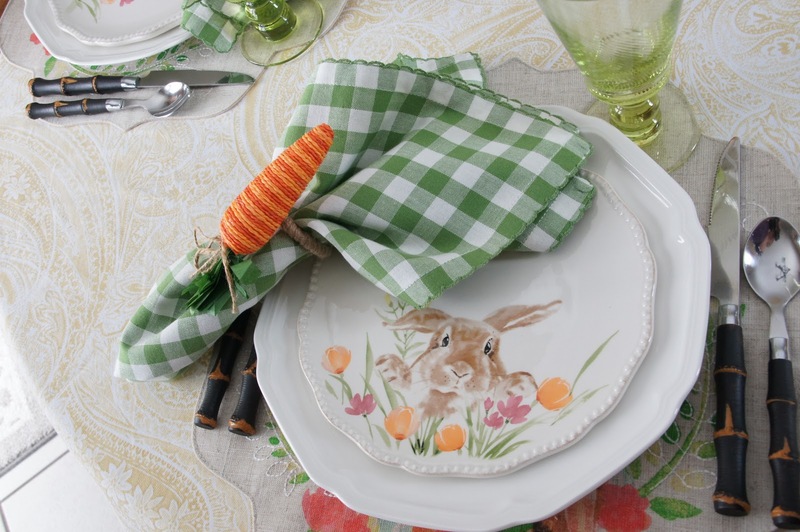 I REALLY like the carrot rings on the green and white checkered napkins! THAT is Spring!!!! Liz, This is such a cheerful table, it is taking me to a happy place!! 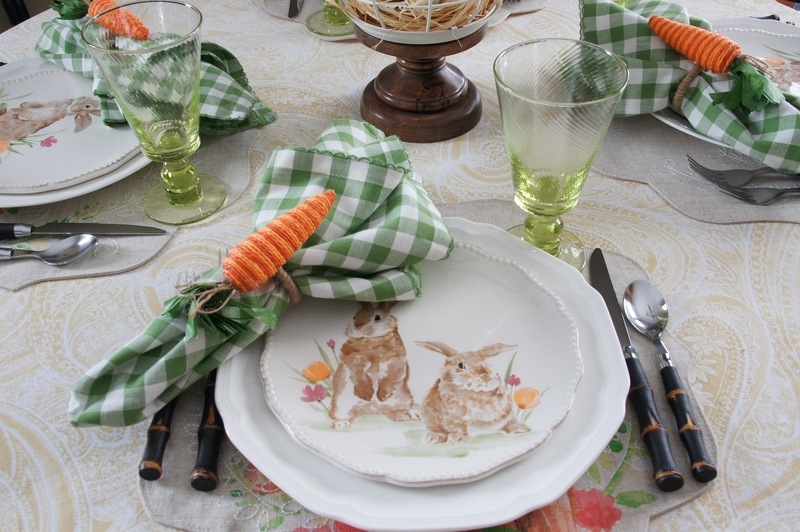 Those bunny plates are precious and the napkin and carrot rings are perfect - it almost looks like those bunnies are going to jump off the plates to eat the carrots!! Another beautiful table setting Liz. 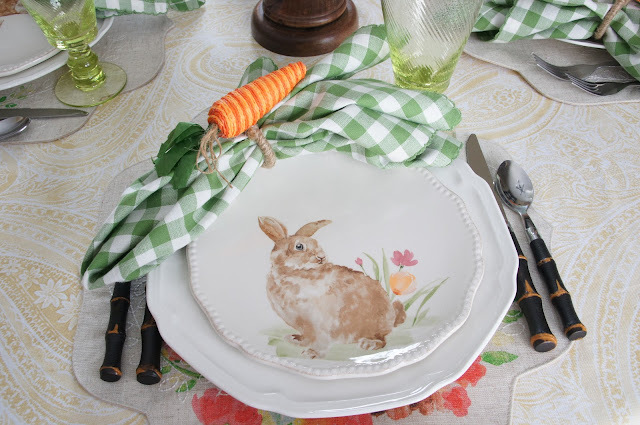 Love those bunny salad plates. Too adorable. 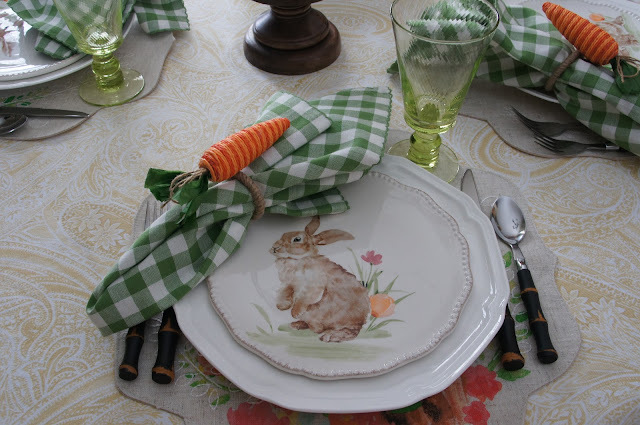 Love the bunny place mats too. It is all so cute.